In honor of Mew, our beloved cat, who passed on to greener pastures today. He leaves us with 17 years of “cat magic” memories and love. May he now find enticing new smells, room to run, boulders to pounce upon, and plenty of unexplored territory to call his own. My beautiful cat decided to see what the fuss was all about on a recent humid afternoon. Perhaps he was bored, or just needed a stretch, but Mew, as he is so aptly named deigned to prowl with me in search of weeds. He put on a good show of loyalty and interest. 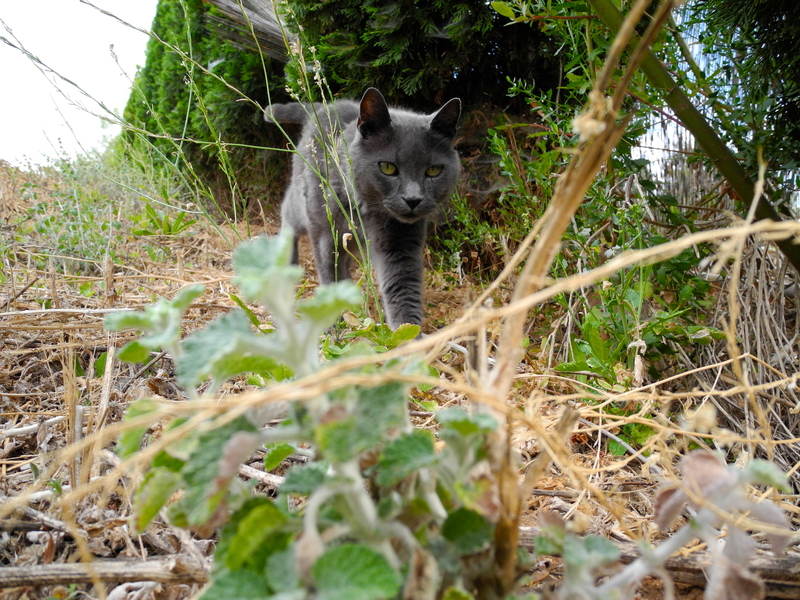 No matter how nonchalant Mew always prefers to be, he did reveal his hunter instincts to me as he silently padded through the weeds without disturbing a single one. His keen eye took them all in and, because nothing was trying to run away from him, he let all the weeds be in complete dignity. Sorry to hear Mew is no longer with you. It is difficult to lose a beloved pet.